View, open, and print MS Word/PowerPoint documents. Is there a better alternative to icWord? Is icWord really the best app in Word Processing category? Will icWord work good on macOS 10.13.4? 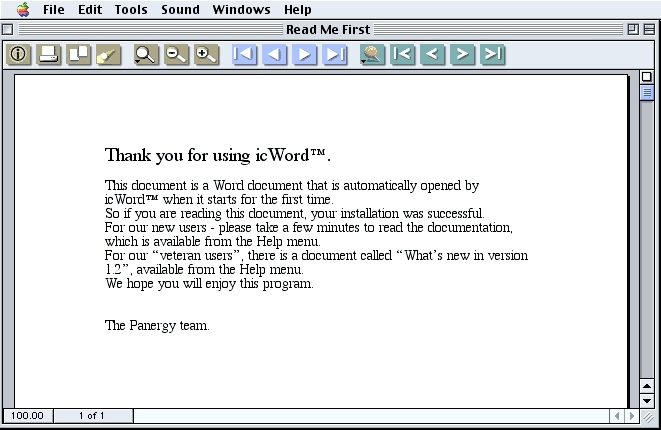 icWord lets you open, view, print, convert and use Microsoft Word, PowerPoint and AppleWorks files. The simple WYSIWYG functionality enables you to access their native files (created in either a PC or a Mac) with their original formatting preserved: font size and style, paragraph (margins, alignment, line spacing, numbering), tabs, tables, headers and footers, page attributes, graphics, colors footnotes (added as numbered endnotes after the text body). Version 4.0 for Mac OS 9.x is available here. icWord needs a rating. Be the first to rate this app and get the discussion started!